How To Grow Curry Leaves Fast And Easy? These Are Great! / How To Grow Curry Leaves Fast And Easy? These Are Great! Curry is one of the popular spices in the world due to their flavor and aroma allowing anyone to prepare delicious dishes. Despite the easy accessibility of leaves and powder at local stores, having your own supply is much better. That leads us to the question how to grow curry leaves at your own backyard or garden, which we’ll definitely answer. 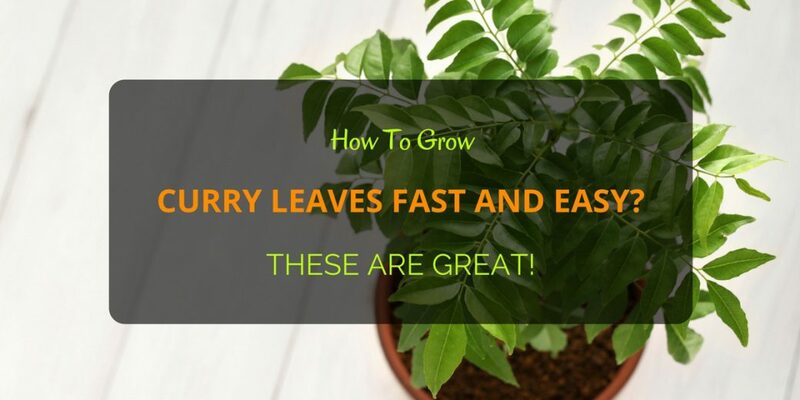 How To Grow Curry Leaves Fast And Easy? Curry plant is native to Southeast Asia, particularly the Indian subcontinent. It’s known for its distinctive aroma scent and spicy flavor. Generally, the leaves themselves are sweet but pungent at the same time. That’s the regular type, which is commonly grown almost everywhere, both in warm and cold areas. This is also the tallest among the variants of the plant. The gamthi species is stronger in aroma. The main use of curry leaves is seasoning of dishes. The powder ones are usually added as spices to give extra strong flavor in some recipes. This herbal leaf can be also used in making some fresh brewed teas. You can also add a little powder in your coffee or milk. Other than for culinary purposes, curry leaves are essential as medicine. It has anti-inflammatory and antibacterial properties that help heal ailments including cold virus and fresh cut wounds. Along with the leaves, the fruits that look like small black berries are edible too. However, the seed should not be consumed as it’s poisonous, so keep it out of children. How to grow curry leaves involves basic knowledge and less effort. Nevertheless, it’s something to considerably taken into serious care. This kind of herb grows faster and fully in warm, humid areas. Hence, tropical places like Asia and Latin America are perfect places. But this doesn’t mean that colder areas like most western countries are not a good place to grow them. As long as there’s full sun and adequate watering, they can grow just fine. Here are some quick tips on how to grow curry leaves for first timers. Choose whether you’re going to plant curry from cuttings or seeds. If seeds, go for fresher ones as they produce better germination. Cuttings must be also planted quickly in the soil while still freshly cut. Cut about 3 inches stem with leaves. While an open ground is a safe option, curry plants can be grown in a medium to large pot. It is easy to monitor the amount of water needed this way. Plastic or clay pots can do. Pour some soil that fill in half or 1/3 of the pot. Place the curry plant in the soil. Fill in the pot with more soil until only an inch is left empty. It’s important to have damp soil right after planting the curry. Do not just leave it dry. Make sure to regularly water it once a day. Besides, water is a basic requirement on how to grow curry leaves. There is a need of patience when growing curry leaves. It may be too slow for you to see a height of 1 foot to 10 inches within a year. Do not give up thinking it is almost dying or not growing good. That’s a normal growth indication so just continue your gardening tasks. It helps if you do regular watering and place the plant in full sun. That’s why it’s best to start sowing after winter to have enough period for it to grow. It really doesn’t tolerate frost or a freezing temperature. Also observe pruning or removal of leaves that have been dried or died, usually brown in color. This helps promote better foliage. In addition, add some fertilizer that contains a good amount of nitrogen. Do this once a month. If necessary, transfer the plant if it grows and use a much larger pot. You may place it in a greenhouse or indoor while young, but still need full sun at some time of the day. Avoid putting it in a windy area as this plant has thin and fragile trunks. This is the fun part and it’s very easy to do without the use of shears or scissors. You can pick fresh leaves for consumption or medicinal purposes with your own bare hands. What’s good about spices or herbs is that you can store them and still useful for months or years. You’re not lucky to learn how to grow curry leaves but also the fact that you can easily store them. Just allow them to dry and place in a container with lid. Once dry, you can use them for brewing or seasoning. You may also just grind them to create powder. Since the whole process is easy, there’s no problem on how to grow curry leaves.